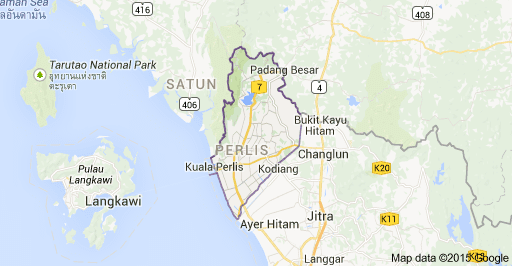 Perlis is the smallest state in Malaysia. It lies at the northern part of the west coast of Peninsular Malaysia and has the Satun and Songkhla Provinces of Thailand on its northern border. It is bordered by the state of Kedah to the south. The formal name of Perlis is Perlis Indera Kayangan. It was called Palit (Thai: ปะลิส) by the Siamese when it was under their influence. Perlis had a population of 227,025 as of 2010. The capital of Perlis is Kangar, and the Royal capital is Arau. Another important town is Padang Besar, at the Malaysia–Thailand border. The main port and ferry terminal is at the small village of Kuala Perlis, linking mostly to Langkawi Island. Perlis has a famous snake farm and research center at Sungai Batu Pahat. Among the main tourist attractions are Perlis State Park and Gua Kelam. The ethnic composition for the year 2000 in Perlis was: Malay (174,805 or 79.74%), Chinese (21,058 or 9.6%), Indian (2,658 or 1.21%) and others (20,690 or 9.45%).As of 2010 the population of Perlis is 87.9% Muslim, 10.0% Buddhist, 0.8% Hindu, 0.6% Christian, 0.2% Taoist or Chinese religion followers, 0.3% followers of other religions, and 0.2% non-religious.